Have you ever heard a story on the radio about a female celebrity who once again had done something trashy or ridiculous? 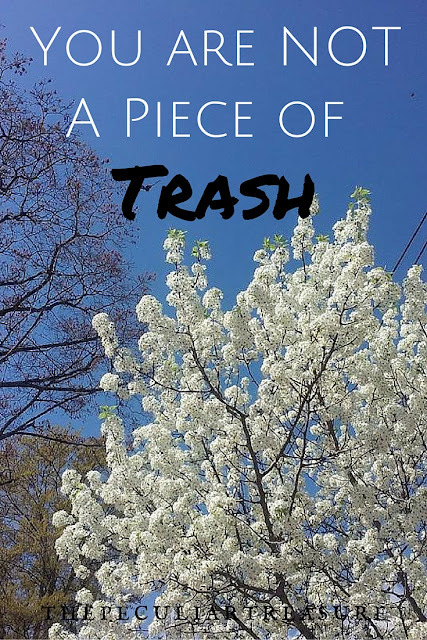 Did you ever find yourself thinking "what a piece of trash!"? Confession: I have! I hate trashiness. I do. I cannot stand to see women (celebrity or not) do things just to get as much attention as possible. I hate the pride, the selfishness, and the vulgarity. But I also hate that I have ever thought of these women as trash! Sometimes, people do trashy things. It's totally acceptable (and biblical) to recognize when an action is trashy. But what is not biblical is saying that, because someone does something trashy, means that they become a piece of trash themselves. I typically do not have those thoughts. I often see people in a better light than that. But occasionally, those wrong thoughts creep in and I am ashamed. And the scary part is, I know that those thoughts are not just mine- they are widespread! This wrong-thinking needs to be demolished. Those women are not pieces of trash- neither are you and neither am I! Jesus paid a great price to rescue us- death on a cross. He bled and died so that we could be free. Jesus doesn't die for trash. He dies for His beloved. Jesus never looked at me, or you, or the "trashiest" person you could think of and thought "what a piece of trash! They aren't worth it". No, instead, Jesus looked at us, saw our sin, shame, and brokenness, only to say "I love them. I will die for them (Matthew 20:28). Jesus is perfect. He always has been and He always will be. So if Jesus can look upon us dirty sinners and be filled with love and sacrifice, why do we find it so difficult to love others? We have been shown great love. A great price was paid for us. The least we can do is love others even if they appear "unworthy" to us. Listen, I was a good kid growing up, so I know how it feels. We say, "oh yeah, I'm a sinner" and yet we judge others much more strictly than we judge ourselves. Well how about we get over ourselves long enough to look in the mirror... I may not have done that trashy thing that celebrity did, but I certainly have hurt the feelings of the ones I love, I have lusted, I have lied, and I have gossiped. I've done bad things. So have you. And so if we treat people without love because of their sin, are we not being exactly like the Pharisees in John 8? The teachers of the law and the Pharisees brought in a woman caught in adultery. They made her stand before the group and said to Jesus, “Teacher, this woman was caught in the act of adultery. In the Law Moses commanded us to stone such women.Now what do you say?” They were using this question as a trap,in order to have a basis for accusing him. None of us could throw a stone, because every single person on earth has sinned. We need to give a whole lot more grace than we are accustomed to giving. 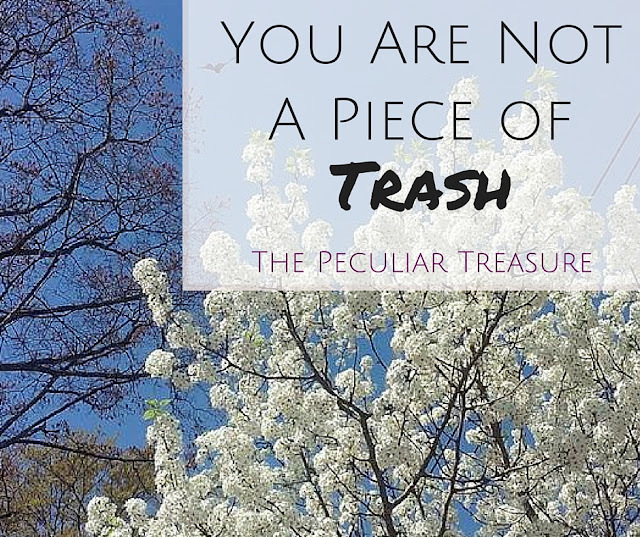 We need to realize that a person is not a piece of trash simply because they make some bad decisions. You and me, we are the same- sinners who need Jesus. You and me are valued in God's eyes. You are not a piece of trash. Neither am I. Let's stop shaming others, and instead, build them up. Let's stop thinking awful things about people, and try to encourage them instead. Do you struggle with thinking people are a piece of trash? Are you going to make an effort to change? Comment below. This is some great food for thought! I'm usually on the opposite side of this, though, standing up for whomever is being accused of being a piece of trash. I totally agree with you here. That's wonderful, Lindsay! For me, I usually am the one sticking up for people too. I more struggle with my inward thoughts. I give them the benefit of the doubt outwardly (and I really do care about them), but I have an inward struggle that makes me think negatively. So true, name calling, criticizing and judging other people can be easy to fall into. Personally though, I find that I am usually harder on myself then I am on anyone else. Yeah! I think it depends on the topic for me. Oh girl, you are SO NOT TRASH. You're right - He paid a price for us and it just PROVES that we are so the complete opposite of trash...we're gifts and worthy of love and He loves us more than we could ever even fathom!